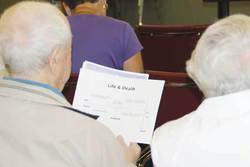 “People of all ages should be very aware of having a personal directive, a will, and making a power of attorney,” states Kerry Polasek, Administrator of Sunrise Village, a seniors residence in Wetaskiwin. “I am questioned about this all the time from my residents at Sunrise Village and their families.” In response to the constant demand for information and the importance of providing current information, Kerry partnered with the City of Wetaskiwin FCSS to host the ‘Life and Death’ workshop for the residents of Sunrise Village, their families and the community of Wetaskiwin. Over forty people attended the workshop of which thirty were from the community of Wetaskiwin. The guest speaker was highly respected Carole Aippersbach, a lawyer who obtained her law degree from the University of Victoria and was called to the bar in 2000. “I have heard Carole speak at previous Senior Wellness Seminars and was very impressed with her presentation. She uses terminology that the average person understands, and makes the information as much fun as possible,” explains Polasek. Aippersbach has worked in both the private and public sectors. In 2007, she joined the Legal Resource Centre, a public legal education organization. Her responsibilities include research, drafting, and giving presentations about various legal topics. Sunrise Village will be hosting a Pumpkin Pie Thanksgiving tea on October 12th from 2 to 4 pm for residents and guests.